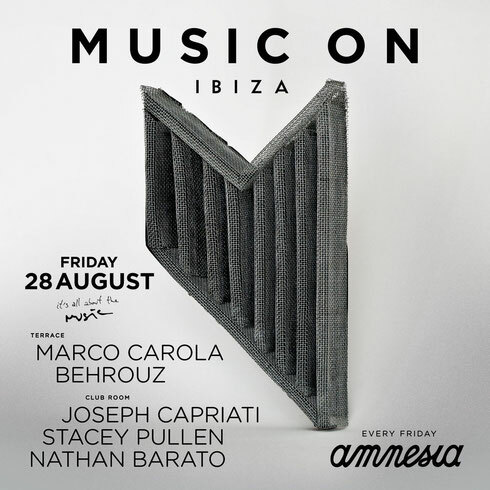 With more than half the season already over, the last Music On in August lands tomorrow and Marco Carola has prepared a line-up to close what has been a big month at Amnesia Ibiza. In this 13th week, DJ and producer Behrouz visits for the first time, while his compatriot Joseph Capriati returns along with Stacey Pullen and Nathan Barato. Marco Carola is arguably responsible for one of the most distinctive sounds in the electronic music industry and tomorrow he’ll be on the Terrace with Behrouz. The American artist brings a peculiar style which is difficult to categorise but based on sub-genres ranging from sensual deep notes to a purer techno sound. A unique and interesting contrast that aims to strike a blow on the dancefloor. Completing this musical format, in the ClubRoom it’s Joseph Capriati. On top of that, Stacey Pullen brings more progressive sounds which he pioneered in the origins of Detroit techno and established artist Nathan Barato is also on hand to showcase the more delicate and elegant side of the scene.